Expat Canadian animator, Chris Williams, is running a Kickstarter campaign for an ambitious short film, The Sketchbook. 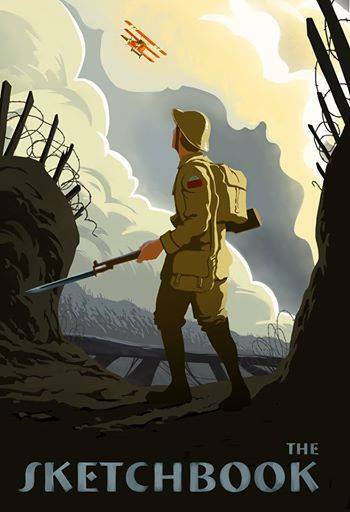 It’s a Canadian story of a 16-year-old boy who enlists in the army to search for his father, who is away at war in World War I.
Chris has set himself a goal of $198 000 dollars to produce this film. With only 5 days to go in the campaign, it looks unlikely he’ll reach it, but that’s not a comment on the film itself. Chris has a great story to tell, and while he may not get to tell it with his Kickstarter funds, I’m hopeful he perseveres and finds a way. Please go check out the page. This entry was posted on Monday, June 23rd, 2014 at 1:23 pm	and is filed under News. You can follow any responses to this entry through the RSS 2.0 feed.